Remember that 1996 sitcom with the talking cat, two crazy aunts and a bewitching girl? Well it’s back, but this time with a dark twist. Netflix released The Chilling Adventures of Sabrina on October 26, and it’s been getting a large amount of attention in the short time it has been out. The show came out as a sister series to Riverdale, because of how quickly it rose to popularity, and the plot reveals clear similarities. Both are originally based on comic books by Archie Comics. This new Netflix rendition diverges quite a bit from the original sitcom, Sabrina the Teenage Witch. With a darker tone, the plot contains less humor and tackles deeper themes than the sitcom did. However, it still contains the same main characters, Sabrina, played by Kiernan Shipka, and her two aunts, Hilda (Lucy Davis) and Zelda (Miranda Otto). Disney channel star Ross Lynch plays Sabrina’s boyfriend, Harvey Kinkle. Half-witch, half-mortal Sabrina has the same struggle of being torn between her family’s world of witchcraft and her friends and boyfriend in the mortal world. Unlike the sitcom where Sabrina starts at a new high school and doesn’t know anyone, in the Netflix series Sabrina begins with a strong group of friends and in a long-term relationship. With her 16th birthday fast approaching, she has to say goodbye to them and prepare to fully immerse herself into the witchcraft world by signing herself away to the dark lord. While Sabrina is being forced to go to a new school, the Academy of Unseen Arts, she also starts finding out secrets about her parents that have been hidden from her. When she arrives at the new school, she is confronted with a hostile environment and a whole new group of enemies. Along with some plot changes, The Chilling Adventures of Sabrina includes demonic monsters, ghosts and some gruesome killings. The killings are very realistic, adding several levels of terror to the show, but the monsters seem unrealistic, somewhat akin to monsters in Buffy the Vampire Slayer, another older show. Although they are accompanied with special effects and sudden sounds, these effects took away from the true horror-feel of the series. Sabrina’s powers allowed her to be able to get revenge on people she wouldn’t normally have been able to, allowing for some interesting events. I often found myself rooting for Sabrina – and against whoever she was avenging. Sabrina is a likeable character, but her character could have benefited from writers adding a little more complexity to her. Although she is dealing with some tough issues, she seemed to be a perfect, fully-formed character from the first episode, which is unrealistic for a fifteen-year-old and didn’t allow her any room for growth. Overall, the plot was exciting, scary and enjoyable to watch. If you liked the feel of Riverdale, you will love this new series. There hasn’t been a witch show that has come out in a while, and none quite like this one. 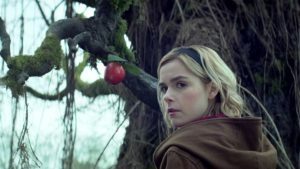 The Chilling Adventures of Sabrina is available on Netflix now, and if you’ve already binged season one, season two is confirmed and on the way!